Please visit my YouTube Channel where my videos are hosted. The videos are arranged in playlists, so it is easy to select a category in which you may have an interest. Katie’s Company – The World’s Only Luxury Coat Bag Introducing the Abrigo Bag – The World’s Only Luxury Coat Bag. Inspired design. Custom fabrics and artistic detail – built tough enough for the real world. 5 videos, 1 hour, 44 minutes. Videos filmed while in Nepal, trekking to Everest Base Camp and back, October 31 to November 23, 2013. I also included my Everest 2011 Trek Edited and Narrated video here. 6 videos. Jessica Grové, Chris Rayis and Douglas Waterbury-Tieman proudly present the first installment of THE MUSE CYCLE. The theme for this first performance was BEGINNINGS. 19 videos, 1 hour, 44 minutes. A collection of Jessica’s performances from the internet and from our archives. Click on the thumbnail or the link for each album below to be directed to the Photo and Movies Gallery on my MobileMe website. Some of the videos are uploaded in large format, which takes just a little longer to load, but which makes the viewing more pleasurable. You may want to wait a couple of minutes before playing it, or allow the download to catch up if the video stops, then press play or the space bar to continue. Where available, you may click on the Medium format – it should stream with no problem. You will need QuickTime 7.2 which you can download for free before playing the video. Katie and I had a wonderful visit with Tommy, Yuki, and Ryusei in San Francisco in October. From just hanging out, to baby sitting so that Tommy and Yuki can get out (at least that was our excuse! ), to a bike ride across the Golden Gate Bridge to meet Yuki, Katie and Ryusei in Sausalito for breakfast, and then on to Tiburon, and back San Francisco. A lovely morning on the road! Came back to watch The Blue Angels from Tommy and Yuki’s rooftop. What a view! Lovely dinners, but most of all, a great time with our son and daughter-in-law, and of course our Ryusei!. Well, I couldn’t resist. Yuki sent me a bunch of photos from our trip to San Francisco in October. I took about 40 of them and added 20 of mine to put together this two-minute slide show. Click on the image above to load the slide show. This will take you to my MobileMe Gallery. Photos by Katie and Willie. I will add more photo galleries, including photos by others as time permits. Wrangell Sunset: After a wonderful day visiting the Leconte Glacier, we enjoyed a sundowner. We were treated to a spectacular show. Dove Island Lodge: Day 1: Our first day fishing was very successful. I caught the largest King Salmon of the trip: 30 pounds! Here are a few funny clips. On February 13, 2010 we celebrated the marriage of our daughter, Jessica Grové to Dan Cooney. Giving away your only daughter in marriage is a momentous experience. I tried to prepare myself for this event, but I could not possibly have anticipated how special this would be. We had almost 100 guests – friends – many who spent the best part of a week or longer with us in our favorite place, Belize, at our condo there on Ambergris Caye. We are honored to have gained Dan as a member of our family, and to have joined his family with ours. Thank you to everyone who made such a special effort to come to Belize to share in this special time in our family’s life. A short film of my new Hobie Cat. I shipped this boat from San Diego where I purchased it as a kit from Fast Lane Sailing. It arrived in San Pedro in many pieces, and Vic Tharp, my brother-in-law and I assembled it with the help of Gato and several other friendly Belizeans. This boat was easy to assemble and is an absolute pleasure to sail! 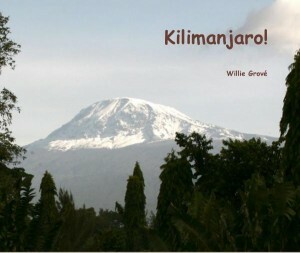 Click on this link: Kilimanjaro!